I'm beyond thrilled and honored to host Kathleen Glasgow on the blog. She's in my Top 3 favorite authors, and I was honestly intimidated to reach out, but then she approached me about doing this. It's a dream come true for me, and I hope you'll love reading our conversation about her books as much as I do. If you don't know much about How To Make Friends with the Dark, I suggest, you check out my review before going on. I knew going into How to Make Friends With the Dark that it was going to be an emotional read. The death of someone close to you impacts you in ways you could not ever imagine. I lost my my mother and my sister within four years of each other. I had no idea what grief was going to do to me. You can read books about it, follow steps for self-care, but it is so hard to live through, and with. I tried to always remember that Tiger was sixteen and losing a mother and what might that mean at that time in her life? I tried to be honest when telling her story: that no relationship is perfect, that guilt is real and feels terrible, that loss hurts so much. I think when writing scenes that carry heavy emotion, stay honest to what your character feels. 2. To create such strong responses in the reader, I imagine writing takes a lot of emotional energy on your part. These complexed and nuanced stories are some of the most important in the YA world, but I think that a lot of writers are nervous to share such vulnerable stories, even when they feel passionate about them. Did you ever consider not sharing either of your books? What advice do you have for writers who are hesitant to share their personally connected or heavy books? I think writers should write what's in their heart. I write the stories that I write because they are the ones that speak to me. I try to be careful in how I present emotional and complex issues. But realistic young adult books aren't the only books that tackle complex and emotional issues. You can find plenty of characters dealing with mental illness, depression, grief, and more in fantasy and thrillers! I ALWAYS feel nervous sharing somewhat personal stories in my books! I don't think that nervousness ever goes away. 3. HTMFWTD explores the foster system as Tiger experiences many different homes after her Mom’s death. How much research did you do leading up to writing the book? Were there details that surprised you or changed the direction of the story? I read blogs by former foster children, researched foster care through articles and books, thought about my mother's story, and then imagined how a 16-year-old girl would feel if she were suddenly put in a home with complete strangers, new rules, and no hope. I tried to give Tiger a variety of experiences in foster care: some good, some iffy. There are so many foster parents out there trying so hard to love and help kids; I didn't want to do them a disservice. We hear a lot about the worst foster care experiences, and of course, that's necessary, but through the character of LaLa, I did want to show that nurturing foster parents exist. 4. Girl In Pieces and HTMFWTD both deal with mental health and traumatic events that aren’t as widely discussed as they should be. Do you have any recommendations for readers who want to help raise awareness about the importance of mental health or support those in situations like Charlie’s and Tiger’s? If you are teen and you know someone who is struggling with self-harm, mental illness, or suffering from trauma, offer them emotional support, not judgement. But also: you are not expected to cure your friend. You can't take on their problems for them. Be a friend. And that means urging them to get help. It means telling someone, like a trusted adult, that your friend needs help, you know? Reading books is a great way to learn more about things your friends are going through and books can also provide a safe way for you to explore your own issues. If you like a book that deals with some of these subjects, tell your teacher. Tell your school librarian. Tell a librarian at your public library. Maybe start a book club with friends and read together and talk about these subjects together in a safe space. 5. Even though How To Make Friends With The Dark is brand new, I’m already excited to hear about what might be coming from you in the future? Are there any upcoming projects you can talk about (or even hint at)? Ha! Thank you for asking that. I'm hoping to be able to share some fun and interesting news in the next few months. *Giveaway Information* If you didn't see it in my review, I'm running a Twitter giveaway for a signed copy of HTMFWTD. To enter, visit my Twitter page (@readwriteandme) where there will be a pinned tweet with more details about how to enter. You'll just have to retweet and comment. 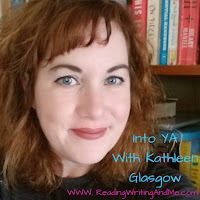 Additional entries will be given to those who follow me on Instagram (@readingwritingandme) and Kathleen. This will close on Friday April 12 when I will chose a winner.